I have to admit that I’m a com­mit­ted fan of the Repub­lic of Bacon. Bacon is the ulti­mate meat can­dy and I’m dying to try out their recipe for Bacon Cook­ies, but the sub­ject of this post is the Bacon Log — which I’m pret­ty sure I first heard about on the Repub­lic of Bacon, but I don’t see it in his list of recipes. The con­cept that I saw was a bacon mat cov­ered with sausage and rolled. They then cooked this in the Bar-B-Q (the grill for Amer­i­cans). While I found this idea appeal­ing, I thought I could do bet­ter. Bacon is eas­i­er to work with if it is par­tial­ly cooked. In this case, we’re going to weave the bacon, so we need it to be a lit­tle bit less flop­py. The eas­i­est way to achieve this is in the microwave. Fold paper tow­el sheets such that you have 3 or 4 sheets deep and place this on a reg­u­lar din­ner plate. Place bacon on the paper tow­el — but only 1 lay­er. We’re going to cook a whole pound of bacon, so when the first lay­er is full, place anoth­er lay­er of paper tow­el and then more bacon. When you’re fin­ished, place a lay­er of paper tow­el on top to con­trol the spat­ter, and microwave for four min­utes (for a microwave of about 1000 watts). Our goal here is to remove much of the water from the bacon but not to start ren­der­ing the fat — this will give us bacon that is still flex­i­ble (not brit­tle) but eas­i­er to work with. 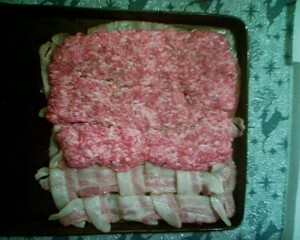 The next step is to weave a mat of bacon (look at the pic­ture to the left). The mat of bacon is going to vary depend­ing on your bacon — this mat end­ed up being 6 strips by 7 strips. 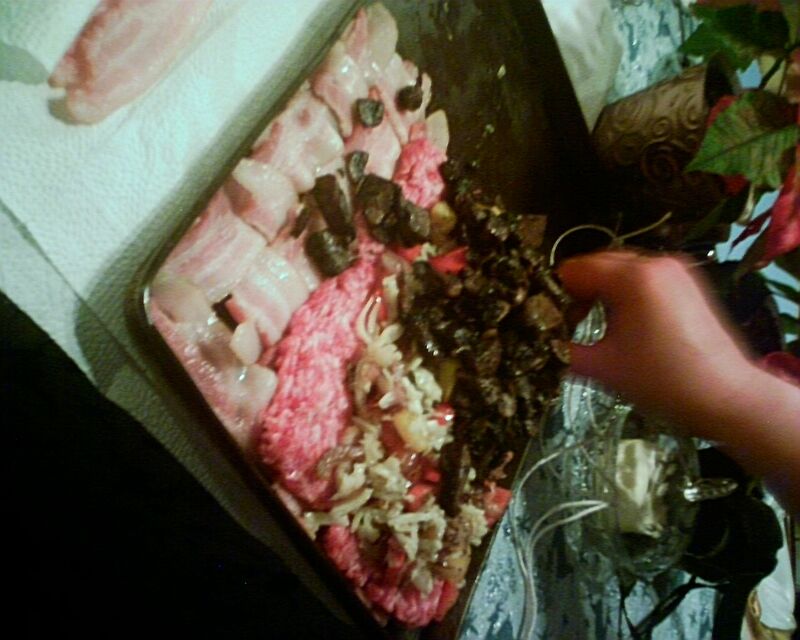 We then added a pound of mild ital­ian sausage which we flat­tened to cov­er 2/3rds of the bacon mat. We do this to make it eas­i­er to roll the fin­ished log. We next mixed the cheese (shred­ded), onions and pep­pers togeth­er to make them eas­i­er to spread. We then want to spread all of this onto the sausage por­tion of your unrolled log. We didn’t mea­sure spe­cif­ic amounts, but one needs to be care­ful that the log can still be rolled. As you can see on the right, the “stuff” comes a lit­tle short of the sausage which comes short of the bacon. You’ll prob­a­bly want two peo­ple (four hands) to roll this. Use kitchen or oth­er non-tox­ic twine to tie it off — it should end up like the first pic­ture on the post. 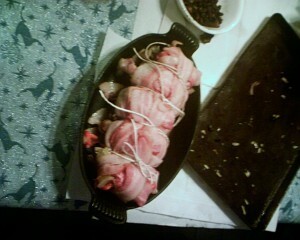 We had two extra pieces of bacon, so we used them to wrap over the ends of the log to try to help with struc­tur­al integri­ty. It sor­ta worked. The first pic­ture also shows it in a cast iron pan — ready for the Bar-B-Q or the oven. We sug­gest 350 F and about 30 to 40 min­utes. Use a meat ther­mome­ter to ensure things are cooked for safe­ty. Astute read­ers will notice that this is Bacon Log V1.0. It was very good. But we decid­ed that fin­er chop­ping of the ingre­di­ents and mix­ing them with the sausage might make a bet­ter bacon log. We also fig­ure that putting a rack in the pan to keep the log out of it’s drip­pings may make it a bit bet­ter. Stay tuned. We’ll prob­a­bly do that lat­er this sum­mer. This entry was posted in Cooking and tagged bacon, bacon log, candy, cooking, grill, meat, meat candy, recipe, republic of bacon, sausage. Bookmark the permalink. Just to add to the above post, when we went to slice this cre­ation (in fam­i­ly meals this always seems to fall to Dad), it fell apart rather bad­ly. While this doesn’t make any dif­fer­ence in the taste, pre­sen­ta­tion of food is impor­tant as well, and from this type of dish, a nice *slice* would look nice on the diner’s plate. The future ver­sions of this will like­ly aim at improv­ing the pre­sen­ta­tion, and mix­ing the veg­gies and cheese into the sausage-meat will hope­ful­ly accom­plish that. Stay tuned. Bad Behavior has blocked 272 access attempts in the last 7 days.